ReclaiMe Pro disk imager is designed to be used by data recovery technicians who often work with devices containing bad sectors. Exactly for such devices, there are many settings in ReclaiMe Pro to configure a disk imager for your particular case. In addition to smart bad sector handling, ReclaiMe Pro disk imager features high speed that is important for data recovery tasks. You can launch the drive imager by clicking the Save image button from the Disk and partition list window. Note that the Save image button becomes active when you select any device, be it a disk, partition, region, or a reconstructed RAID. Clicking the button gives you a drop-down list of the supported disk image file formats. RAW disk image file is a sector-by-sector copy of the device. VHD format is typically used to create a disk image file of the device up to 2 TB for further mounting it on a Windows PC. VHDX image files are created with the same purpose, the difference is that VHDX format supports the devices larger than 2 TB and is only available on Windows Server 2012 and up, and Windows 8 and up. Once you have decided what image file format you need by selecting the appropriate item in the drop-down list, ReclaiMe Pro asks you to specify the target location for the disk image file. 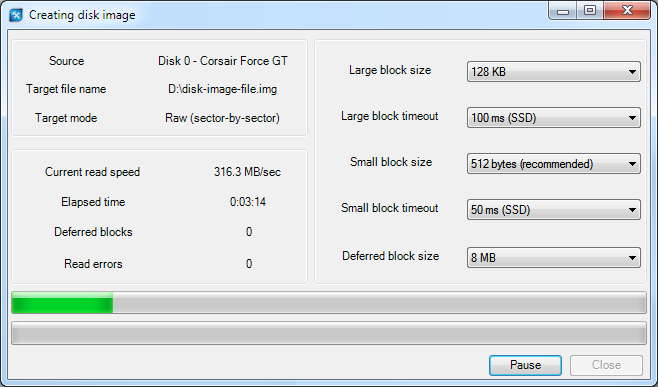 When creating a disk image file, ReclaiMe Pro uses a two-pass algorithm: during the first pass, source data is read in blocks controlled by the Large block parameters; on the second pass, ReclaiMe Pro tries to re-read the areas failed on the first pass, this time using small blocks. If re-reading a particular area fails as well, ReclaiMe Pro declares the area as containing bad sectors and writes specific pattern to the target. Large block size ranging from 128 KB to 4 MB is the request size used to read data from a source device on the first pass. ReclaiMe Pro sequentially reads data from the device in such blocks. The larger the block size, the faster the process of creating an image. However, if a particular block is failed to be read, the area on the source device equal in size to the deferred block is skipped, and the next attempt to read it will be made on the second pass. Deferred block size is used to set the size of the area to be skipped after a failed read operation on the first pass. The parameter values range from 8 MB to 128 MB. The higher the value, the slower the process, since more data should be read on the second (slow) pass. Typically, you need higher values when dealing with physically damaged devices. Using Large block timeout, you can tell ReclaiMe Pro how long to wait for a response from the device when reading data. If the timeout has expired and there is still no response from the device, the entire requested block is discarded, Deferred blocks counter is incremented, and the block is queued to be read on the second pass. 1000 ms (slow or USB HDD). Small block size determines the size of the buffer used on the second pass when ReclaiMe Pro tries to read blocks failed to be read on the first pass. Small block size can be 512 bytes or 4096 bytes. This determines the minimum size of a bad "sector". Consider keeping small block size same as hardware sector size of the device. for a physical disk, the imager shows you the message where you are offered to disconnect and then re-connect the device; reconnecting the device sometimes allows to clear the error. This feature allows to image some USB hard disks, flash memory, or SD cards which tend to stop working completely when a certain bad sector is requested. In this case, a device requires a power cycle to return to the working state. After power cycle is done, the imaging can continue. Number of deferred blocks, that are queued for reading in the second pass. The block size is determined by the Deferred block size parameter. Number of read errors which reflects the number of failed small blocks (Small block size) using Small block timeout on the second pass. The upper progress bar indicates the first pass progress, the lower one refers to the second pass.